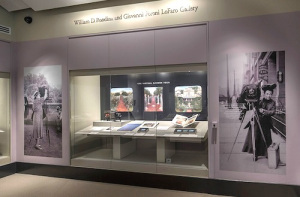 This is an exhibition I hated to miss… Groundbreaking women in Landscape Design – an acceptable profession of the times. Thanks to my sister… always fun to see things through her eyes… Enjoy! Jayme B. Note: The App is worth the effort but will not work on I Pad Mini.. Still fun on the tiny screen. The New York Botanical Garden carved out an ambitious agenda in its Groundbreakers show – to tie the stories of six women of landscaping history, present a two-gallery recreation of an historic garden, pay tribute to the contributions of several landscapes within NYBG itself, create a poetry walk, and wrap it up with the history of early 20th-century photography and high-gloss publishing. They did it with GPS and an iPhone app, courtesy of Bloomberg. Closing this weekend, Groundbreakers: Great American Gardens and the Women Who Designed Them is still worth downloading from iTunes, just to get a glimpse into the lives of six landscape-gardening pioneers, see their work, and understand the popularization of American gardening long before the dawn of HGTV or Lifestyles of the Rich and Famous. Here’s the link. 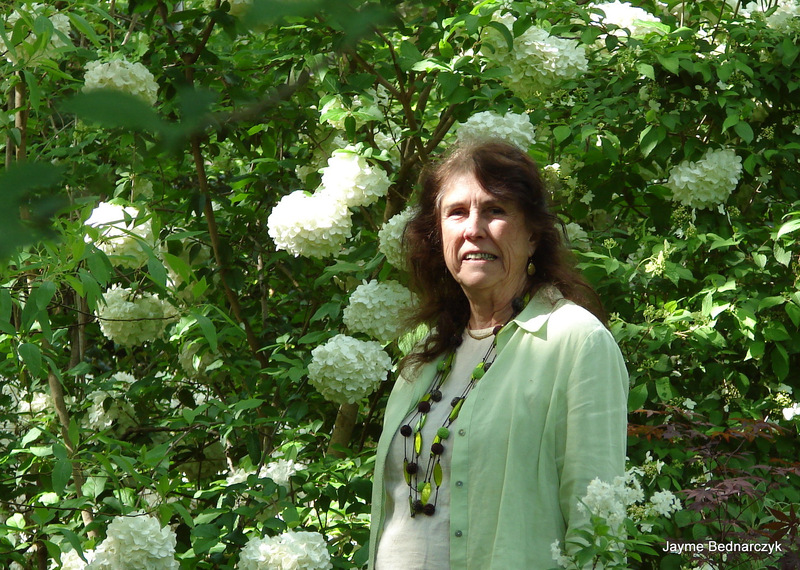 For the Love of Gardening— The Thompson Garden by Kathleen Thompson. The beauty of this suburban garden begins at street side where a path beckons you to enter and enjoy a preview of the abundant plantings that follow. The front garden is a delight of shrubs and perennials showcasing a spectacular thread-leaf Japanese maple. Upon entering the brick walkway at the arbor, you view a gently sloping garden with curved borders and pathways outlined with recycled concrete. Beds, with ever-shrinking lawn areas, are richly planted with perennials featuring a mix of native and specialty plants including tropicals, all in perfect harmony in both shade and sun. 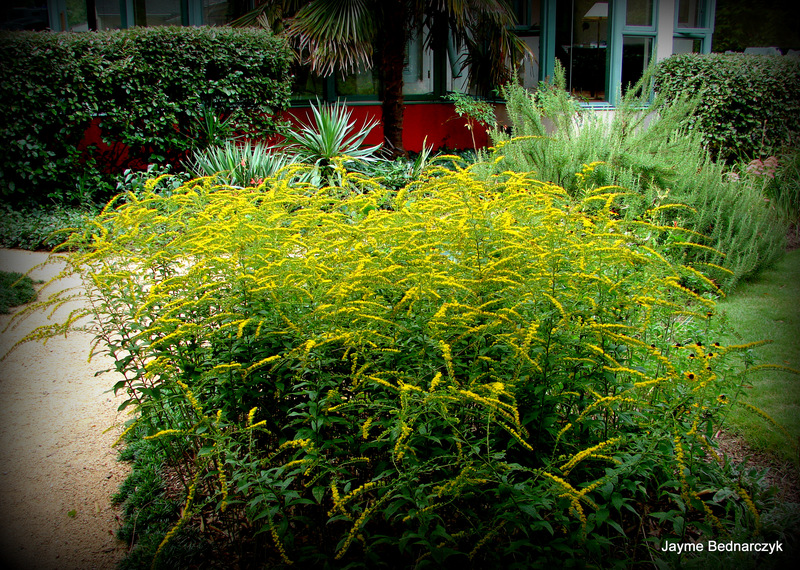 A number of the plants are rare and unusual, collected and propagated at the J.C. Raulston Arboretum. A small pond can be found along the network of twisting trails that lead through the woods to a community lake. 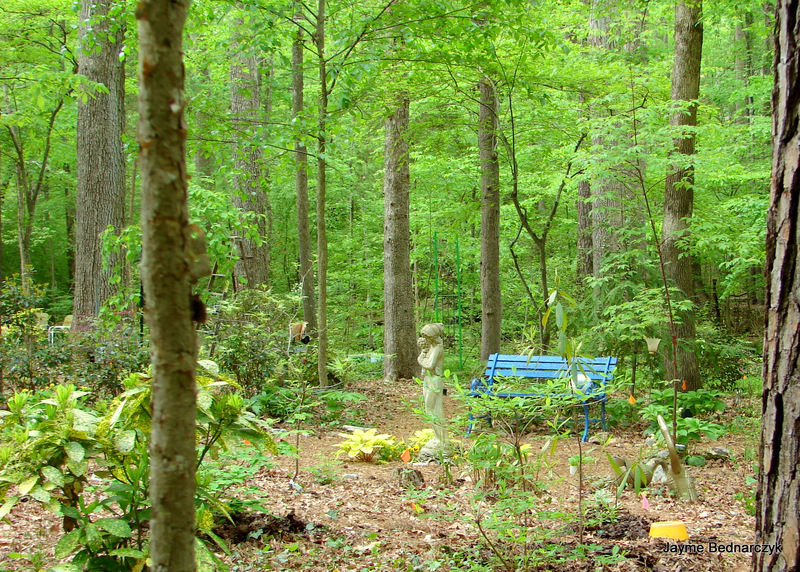 Each area of this garden will elicit a sense of serendipity and discovery of plants, woods, and water. 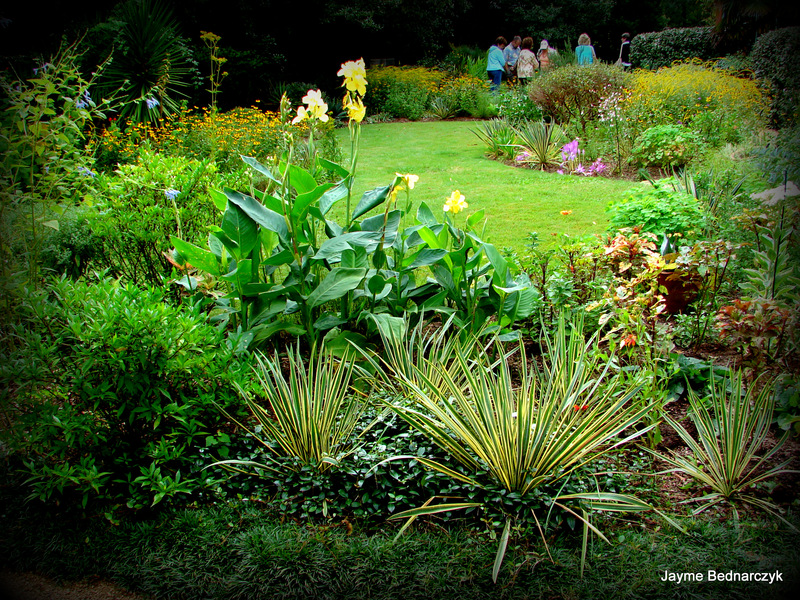 This one-acre gem—of a passionate collector’s garden—was begun 22 years ago. Beth & Juan are the ultimate volunteers… artists and entertainers… I am honored to have them as my friends! 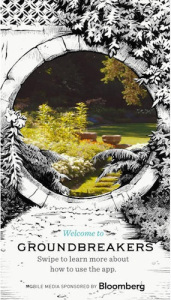 They invite you to visit their Wake Forest Garden. Beautiful mature specimens and paths that wind into secret views—a passion for collecting plants—creating layered textures with antiques. A garden that will make you feel like a kid again—exploring a secret magical place. 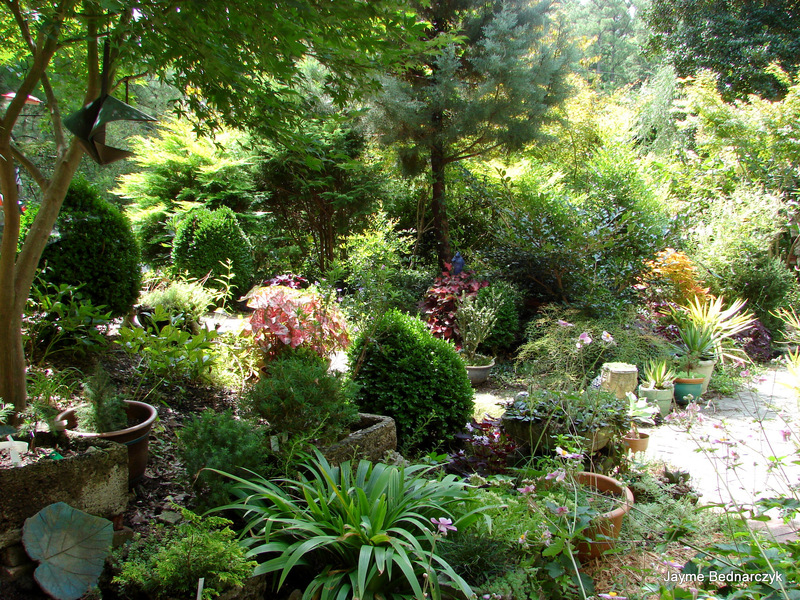 Welcome to the charming collector’s garden of Garden of Jean and Wayne Mitchell. Wayne is an avid golfer and enjoys relaxing with his wife and their family in the garden. Meet my friend Jean Mitchell, the most gracious hostess. When not in her garden, Jean is a friendly welcoming face—volunteering at the J.C. Raulston Arboretum Bobby G. Wilder Visitor Center. 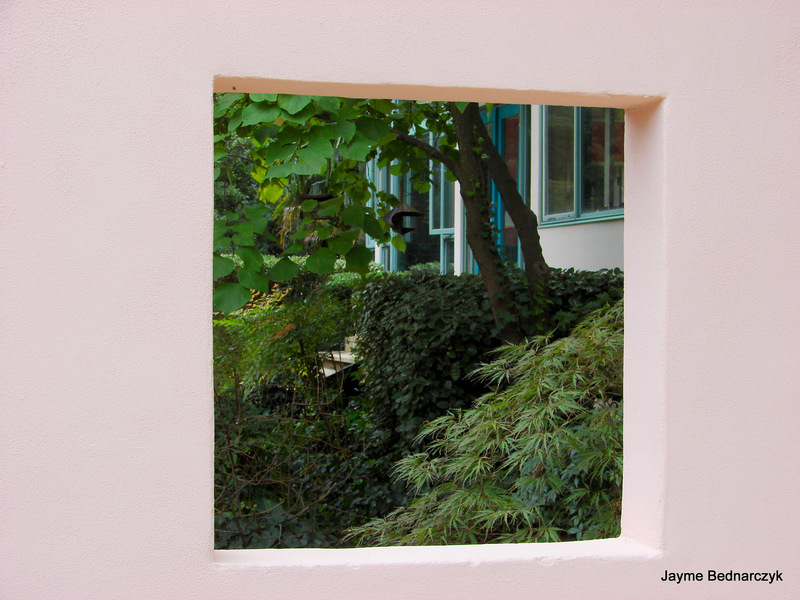 Entwined Life: What do you call your garden? 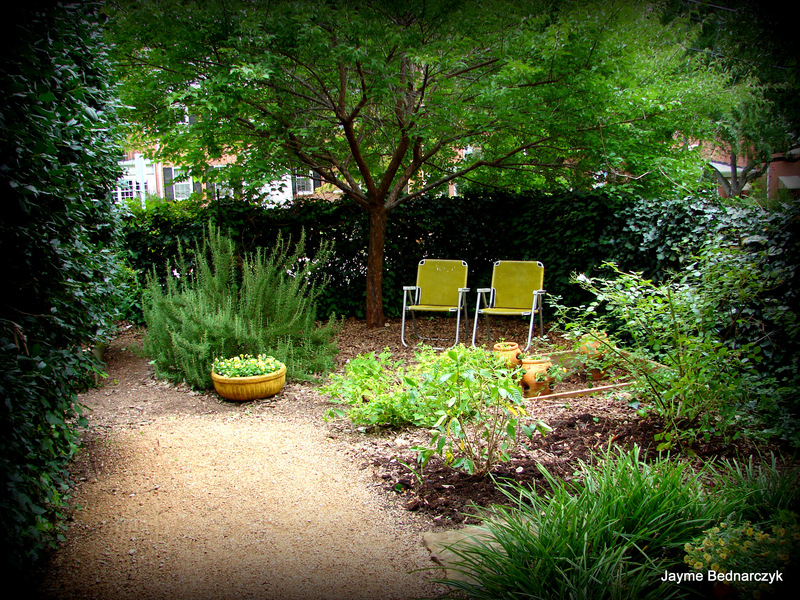 What to you consider your gardening Style? What kind of conditions do you garden in? Rich woodland soil, but lots of roots and rocks. Very shady conditions. Hilly terrain. Do you have any challenges in your garden? Shade and large trees which make it difficult to dig holes because of numerous roots and rocks. Rabbits, voles and deer like to eat foliage. What is the first thing you added, removed or changed in this garden? 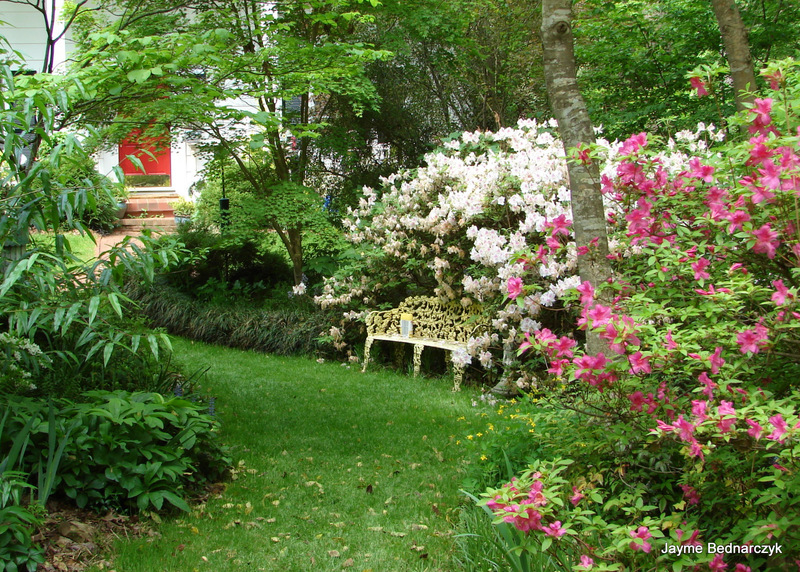 Azalea beds were the original theme to the garden. 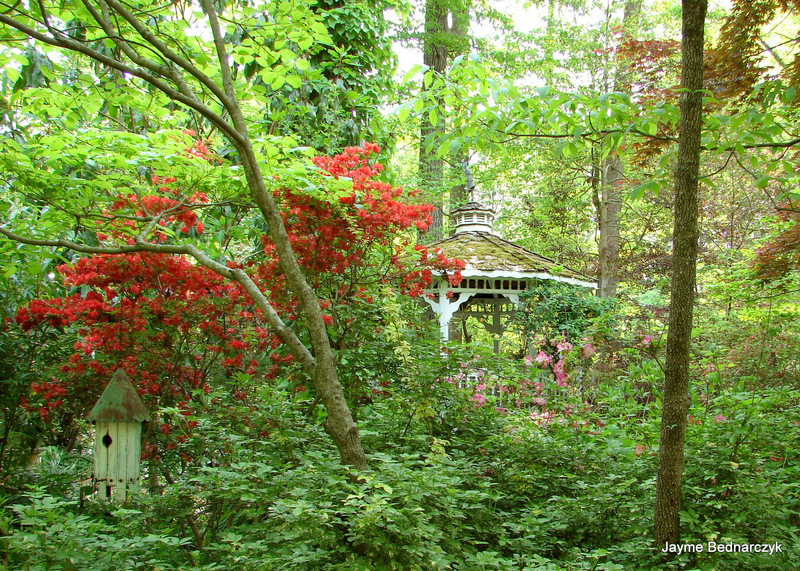 Many of the original azaleas still remain and are now over 50 years old. The biggest change that occurred in the garden was the removal of many trees that were felled during Hurricane Fran in September 1996. This allowed an abundance of sunlight in many of the garden areas for the first time in the garden’s history, and reinvigorated our interest in gardening. Yes! I’m so lucky to be able to get many of my plants at JC Raulston Arboretum where I have volunteered since 1996. Native plants that like shade are my favorites. What are favorite garden tools? I love the mattock and shovel for my planting and gardening, and the rake for the leaves. A couple of hours almost every day. Anything new added to your garden? A Butterfly metal sculpture by Grace Cathey in Waynesville, NC. Helping my mother plant flowers. Each of my sons were given an azalea bed that they tended. Back then my passion was collecting antiques. How many Gardens have you had? Two—one on Ann Street in Cary and our present garden which we have now had for over 50 years! Do you have a favorite Garden Book? I enjoy all garden books! I have many, including my dear friends Mitzi Hole & Suzanne Edney. 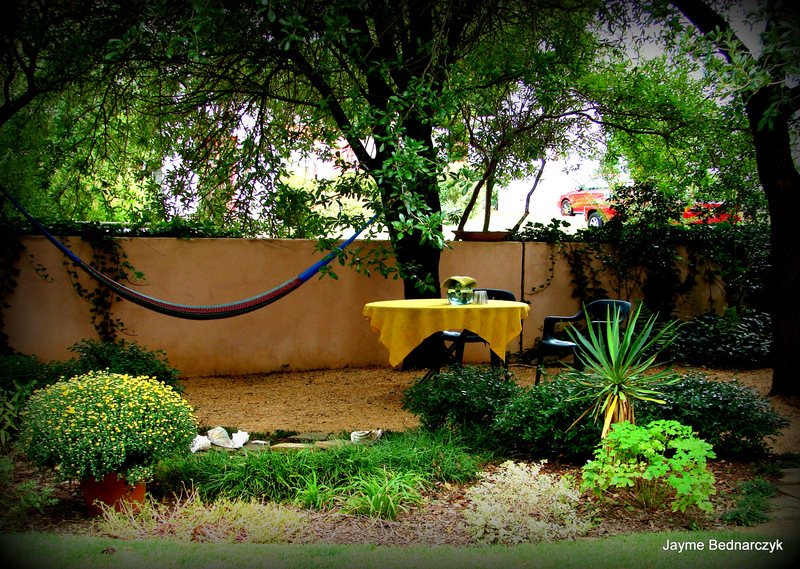 Describe where you most often sit in your garden…. The blue bench on the backside of the house. Nothing! I’m happy and at peace with my garden the way it is. Do you have ‘garden wisdom’ to share? Or anything you’d like to say about your garden? Or anything you’d like to say about your garden? My garden is my peace and passion; a place where I don’t think of anything but my immediate surroundings. 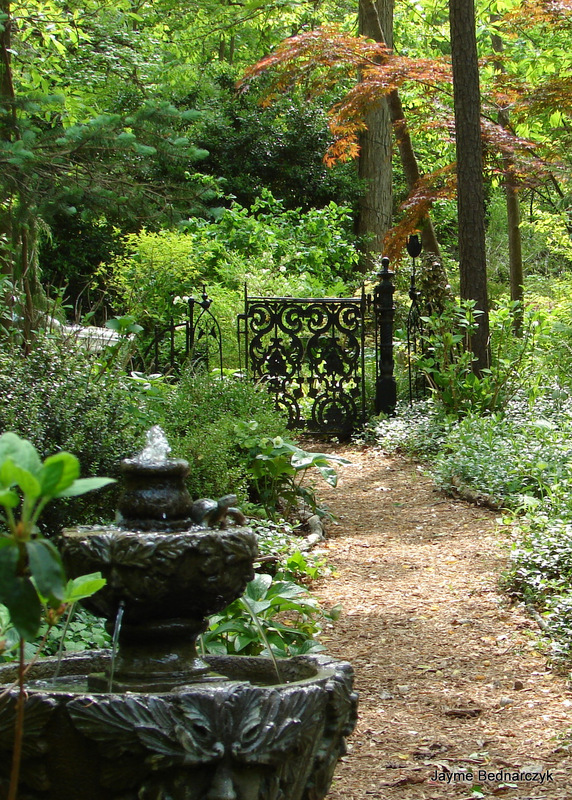 Long ago, neighborhood children named my acre and a half woodland garden, “My Fairy Garden in the Woods.” An antique wrought Iron gate welcomes as you enter into native Sassafras, Bower and Hydrangea lined paths leading to a 3-tiered water fountain. Further on a white Victorian style gazebo beckons to sit a spell and listen. A magnificent Climbing Hydrangea scrambles to the top of a huge Tulip Poplar. Many collector shade plants line meandering paths that lead to a crooked Straight Creek. A glade of native fringe trees winds to the side. Many rare and unusual specimen trees, shrubs and perennials acquired from the J. C. Raulston Arboretum share beds with antiques cleverly placed along paths in this charming collector’s garden. Come Celebrate with Jean and Wayne Mitchell! is featured in this year’s Open Days! 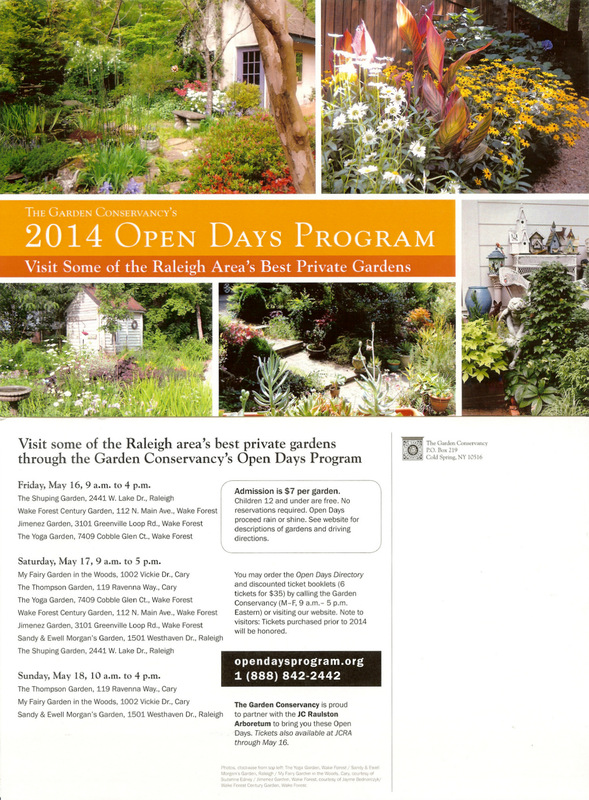 Friday, May 16 | 9 a.m. to 4 p.m.
Saturday, May 17 | 9 a.m. to 5 p.m.
Sunday, May 18 | 10 a.m. to 4 p.m.
Visit seven private gardens in Cary, Wake Forest, and Raleigh, , NC. 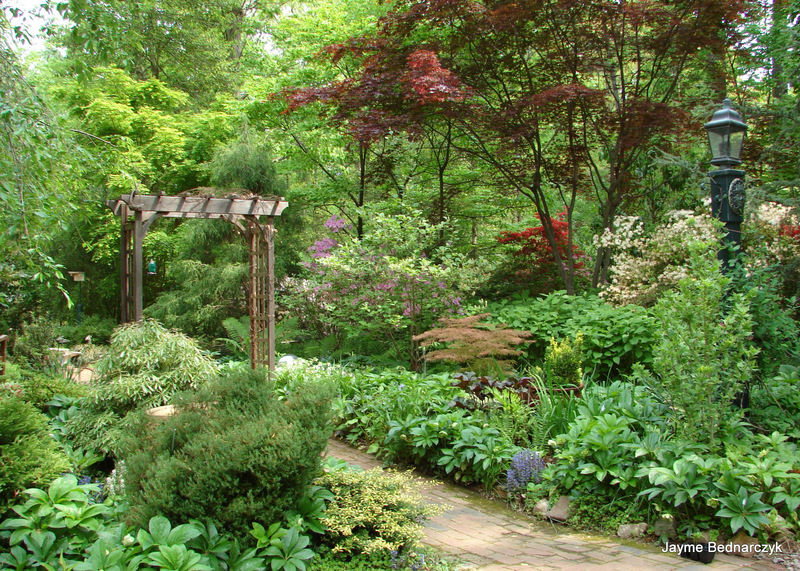 The JC Raulston Arboretum at North Carolina University in Raleigh will also be welcoming visitors. Discounted admission tickets (6 tickets for $35 general / $21 Garden Conservancy members) will be available in advance at the JC Raulston Arboretum (4415 Beryl Road, Raleigh). Admission to the Arboretum is free. Open Days are self-guided and proceed rain or shine. 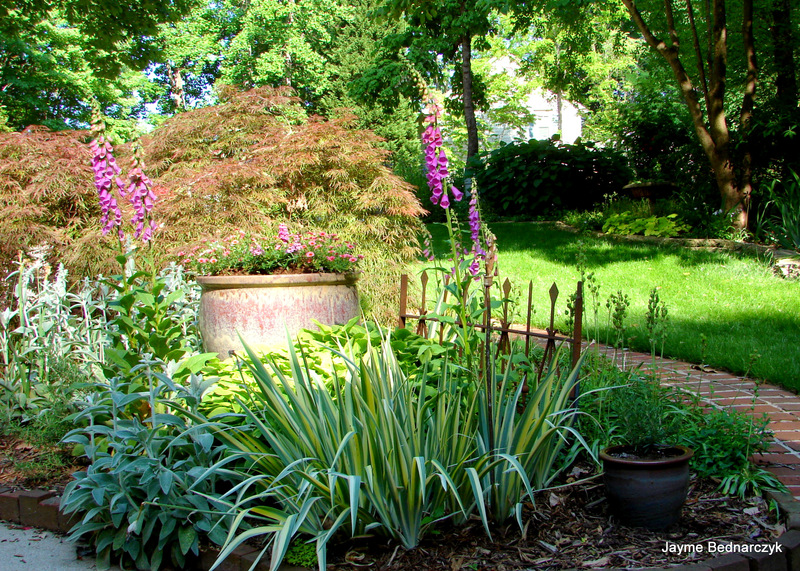 Time to Garden Tour… Garden Conservancy Open Days! These days when you purchase a home, the property more often than not, was likely clear cut when built. Perhaps even the topsoil was scraped and hauled away with the removal of Bushwhacked or Bush-Hogged trees, stumps and shrubs. A mark of adventure for the machine operator. 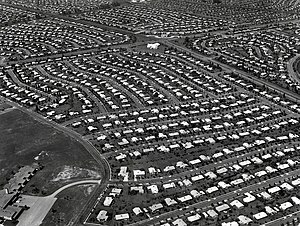 This trend developed in post war 1947 when the first planned community called Levittown emerged. The style emerged to level the playing field of future residents, done for the convenience of the builders, not for the love of the land or to retain the sense of place. Merely mass production of affordable housing a mark of adventure for future prosperous development. The country prospered and someone figured out that all the leftover bomb chemicals could be sold and used to “fertilize” the new suburban lawns. Yes, this creative lifestyle morphed into a heavily marketed middle class status symbol – a small but “Great Lawn”! The Builder then contracts a landscaping crew to add back some landscaping to give it curb appeal… typically these are fast growing evergreens that give the builder some bang for the buck, for saleability, often with no regard for how large the tree or shrub will be in a few years… for the most part unsuspecting homeowners are left with an ongoing task of whacking these back, from blocking windows and doors. Have you ever thought about where our garden plants come from? What is the Mark of Adventure? To be continued… tomorrow part 2 of 4.